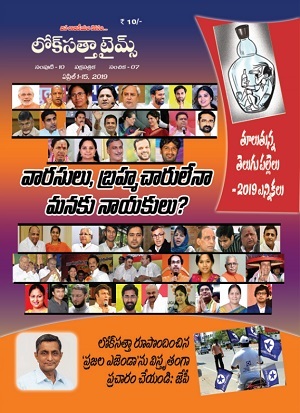 The Lok Satta Party today accused Opposition leader N. Chandrababau Naidu of adopting double standards in promising to appoint a special court to go into corruption allegations against the Chief Minister and his family members while remaining silent on similar charges against him. Those in public life should set an example to others by voluntarily seeking an inquiry if allegations are leveled against them, Lok Satta General Secretaries Katari Srinivasa Rao and Lakxman Balaji told the media here. While welcoming Mr. Chandrababu Naidu’s attempts to launch an agitation at the national level against the Chief Minister, the Lok Satta Party contended that a short discussion in Parliament and formal representations to the head of State and others would not put an end to the scourge of corruption that has struck deep roots in Andhra Pradesh. 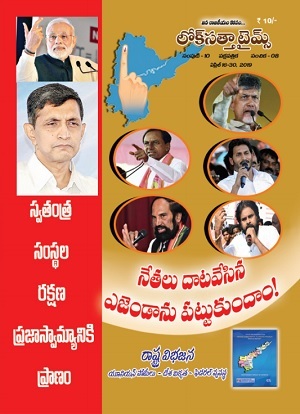 The Lok Satta leaders referred to the exchange of serious allegations of corruption against each other by Dr. Y. S. Rajasekhara Reddy and Mr. N. Chandrababu Naidu and said the party was inclined to believe that “both of them are speaking the truth and nothing but the truth.” That was why the Lok Satta Party has been demanding the constitution of special courts to go into corruption charges against holding public office and confiscation of illegally acquired properties if the charges were proved. “Mr. Chandrababu Naidu, who has turned a deaf ear to the Lok Satta demand so far, now wants a special court to be constituted to go into corruption charges against Dr. YSR, while maintaining a studied silence on charges against him. It is a case of the kettle calling the pot black,” the party leaders charged. The Lok Satta asked why Mr. Chandrababu Naidu should have any reservations in welcoming an inquiry if he has nothing to fear. “Apparently, he is trying to use the inquiry as a stepping stone to come back to power”, the Lok Satta said.